Joseph Thompson Woodworks is a Charleston, South Carolina-based studio and workshop that specializes in creating bespoke, heirloom-quality furniture and decor for the home. The founders, husband-and-wife team of Joseph and Katie Thompson, recently made a substantial investment, weighing approximately 3,000 pounds and is around 70-years old—a jointer. This metal giant is used to produce a flat surface along a board’s length. The acquisition of this tool has greatly emboldened their personal approach to woodworking. The jointer’s main parts include two tables that can be adjusted in height. Located in between them (above) is a cylindrical cutting head encompassing high-speed steel blades. 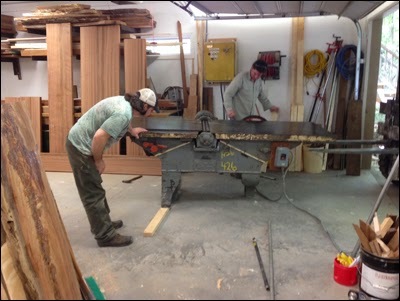 An uneven piece of wood is placed on the in-feed table, set at a certain height, and moved forward toward the cutting head, spinning in clockwise motion, scraping material from the board. After the cutting head removes the board’s exposed material, the board proceeds onto the out-feed table, set at a different height than the in-feed table. The result is a board, formerly uneven, now finely flat. 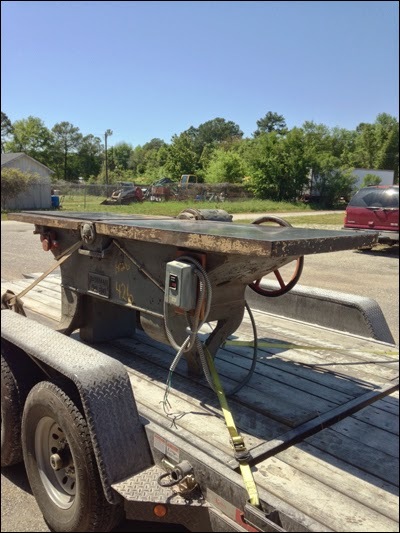 For years, Joseph looked to having a larger version of a jointer. He managed without it, but having one would accommodate bigger projects. It would further allow him to no longer be kept confined to using the smaller version of a jointer in his possession. Its rarity finally became a reality last April 17th, when it was placed (below) on a trailer from a Naval yard to its new home at Joseph Thompson Woodworks. An auspicious day, since April 17th is also Joseph’s birthday. The jointer was built by Newman Machine Company in Greensboro, North Carolina. This company contributed to America’s effort in World War II (1939–1945) by manufacturing woodworking machinery for primarily the armed services. (1) Joseph estimates that the Newman jointer he bought was manufactured between 1938 and 1944. Machines are signs of their times. They are also time machines, surviving, ideally not still, as their surroundings change. War probably compelled the jointer’s origin during the middle of the twentieth century. It became part of a collective effort. Now it’s been nestled into an individual workspace. The machine recovered, its original purpose of woodworking preserved. Situated into a different environment with a different tone and climate—a different time. The jointer is a spectacle of mechanics, a formidable machine. Lots of bulk. Lots of moving parts. Lots of acoustics when turned on. It also equips lots of potential. 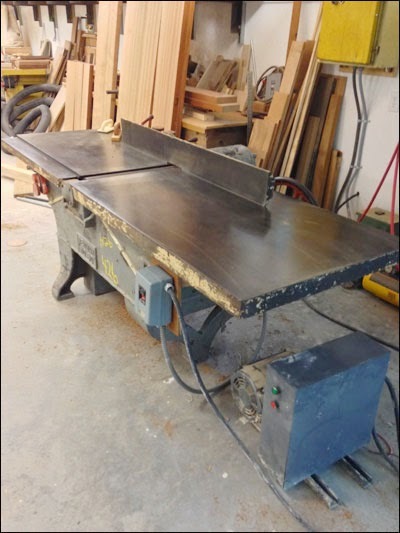 Joseph emphasized the contrast of the Newman jointer, which could take up to a 24-inch wooden board, compared to his other jointer, a smaller version, that could only take up to an 8-inch wooden board. With the larger jointer, Joseph saves time in working with larger pieces of wood. This results in more wooden pieces that can be flattened and assembled together to form seamless surfaces. More so, it results in an extended scope and scale of wooden furniture to envision and craft into shape. When a coveted tool is finally possessed, imagination is fed. In the case of Joseph and Katie Thompson, a flat wooden surface achieved in seconds, than hours, is much preferred. This new capability advances the reception and execution of more ambitious furniture designs for sitting, storing, working, and dining. Machines require feeding. 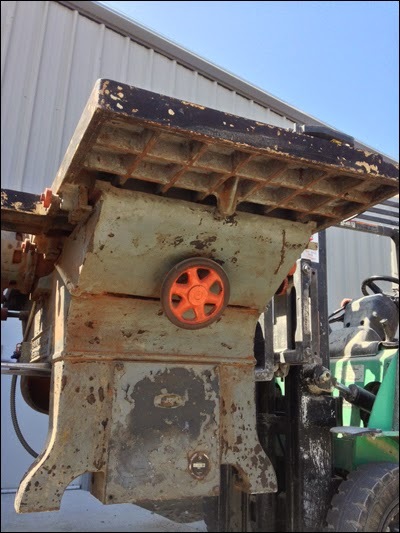 Oil is essential to a jointer’s maintenance—similar to watering a plant. At a glance, it has the weathered appearance and seasoned burnish of something commanding backbone and brains. As a few of its admirers on Joseph’s Instagram feed noted, “Badass!” Joseph Thompson Woodworks’ Newman jointer shares the realm of attention with chisels, sanders, mallets, clamps, and other board members of their woodworking toolkit. A maker’s self-confidence is served by tools. Together, the motives, to make beautiful things, strengthen. 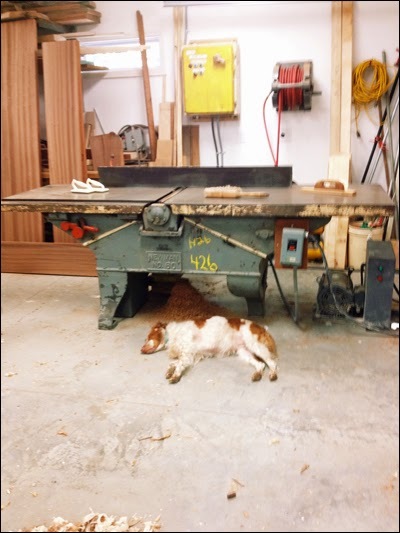 If defense originally drove the making of the Newman jointer, the defense is reinforced by Joseph and Katie Thompson, who are defending the relevance of their artisanal discipline that enriches their generation, adjacent ones, and those arriving into the world of woodworking. When Joseph turns on his Newman jointer, it roars. I suspect that its energy flows down inside him with a roar. Then Joseph roars back. (1) More of the Newman Machine Company’s amazing history at their website. Photographs courtesy of Joseph Thompson Woodworks. Related: Read both my Designer’s Quest(ionnaire), answered by Katie and Joseph of Joseph Thompson Woodworks, and my Interview about their perspective on being craftspeople.